What do you buy a toddler who loves hockey? 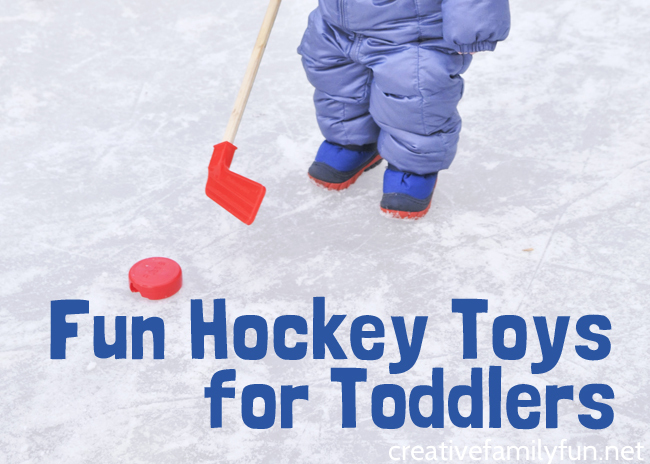 Luckily there are a lot of fun hockey toys for toddlers and their parents. Here are some of my favorite choices. You’ll find great ideas for pretend play, active play, books, and even an awesome toy bench. These are all great gift ideas for your little hockey lovers. Have bath time fun with this cute Hockey Player Rubber Duck. 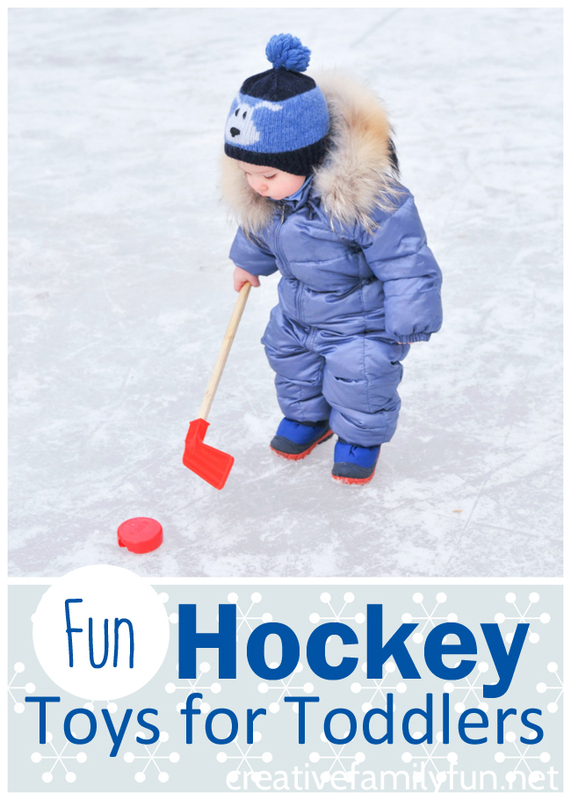 Inflatable hockey sticks are a safe and fun way for your toddler to experience hockey. You can even blow up some balloons to use as pucks! Cuddle up with a cute I Love Hockey Teddy Bear. Even nap time is more fun with a cute personalized ice hockey pillowcase. Play hockey (soccer and lacrosse too) with this fun sports set from Little Tikes. Have a lot of fun pretending with two teams full of Hockey Guys. Play hockey indoors or outdoors with this fun goal, hockey stick, and ball set. Play with a puck that is soft and safe for indoor play. Store all your hockey toys in this personalized wooden ice hockey toy bench. Your hockey lover will love their own personalized wooden hockey stick. Share a fun hockey book together when you read Z is for Zamboni. Or read about hockey at bedtime with this fun book, Goodnight Hockey. Which of these fun hockey toys for toddlers will you be getting? Pumpkins seem to be everywhere this time of year. They make great learning tools. 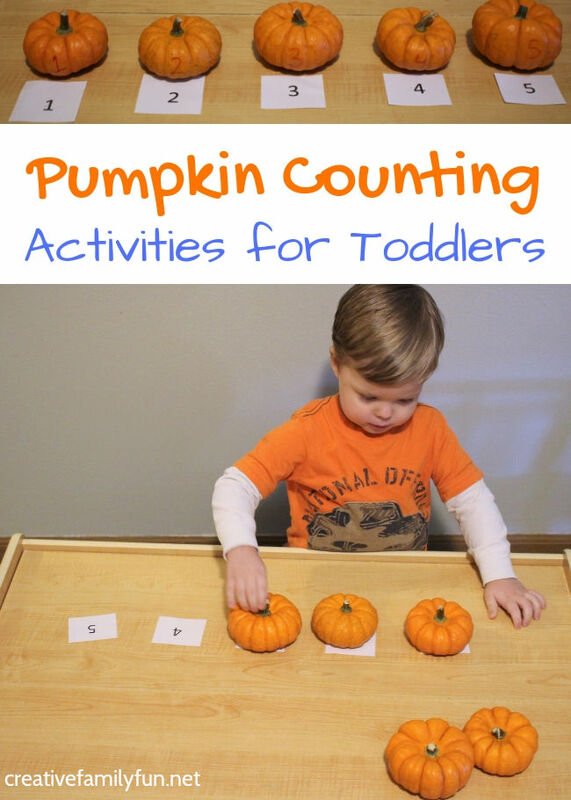 Try out our pumpkin counting activities for toddlers to practice counting and number recognition. I like to use mini pumpkins for this activity. They are easy for toddlers to pick up and handle. Use real pumpkins if you can. Give them a good washing before allowing your kids to play with them. 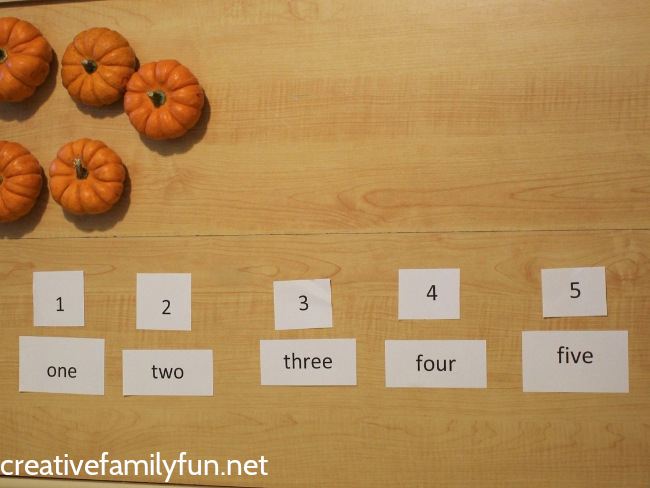 I chose to use just 5 pumpkins for this activity. That helps toddlers really focus on the numbers and get good at 1-5 before moving onto other numbers. If your child has mastered 1-5, feel free to add more pumpkins. Number your pumpkins 1-5. Number five squares of paper 1-5 as well. First, I let my son (age 2.5) just explore the pumpkins. He was free to move them around and play with them for a bit. We practiced counting the pumpkins. Then, I set out the number squares. 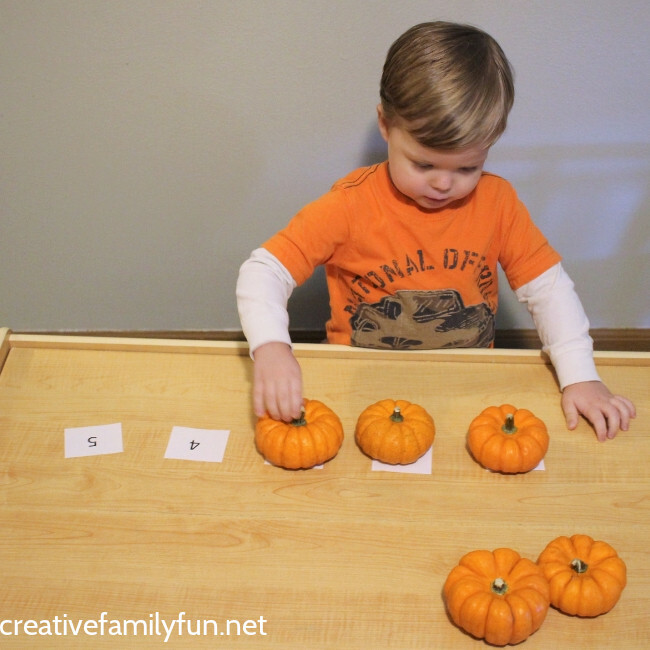 The next step is to have your toddler match the numbers on the pumpkin to the paper number squares. Talk to him about the numbers he sees. What number is on your pumpkin? Can you find that number on the table (or floor)? Place your pumpkin there. Ask your child to bring you a pumpkin with a certain number. Say: Can you bring me the pumpkin with the number two? Since we were using the train table as our play surface, my son grabbed a train nearby and started driving it around the pumpkins. I asked him to drive the trains from one pumpkin to another. Can you drive the train to the number one. Okay, now let’s go to number two. Where is number three? And so on. I had my daughter (age 4.5) do this activity. 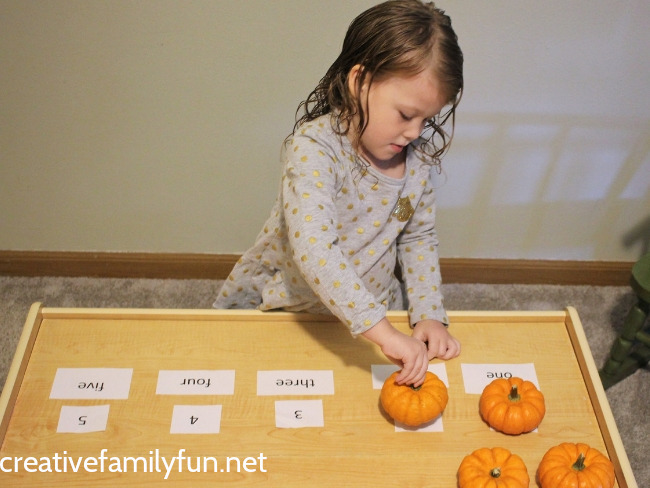 We read the number words and she placed the correct number pumpkin down. For older kids, you could also work on the ordinal number words (first, second, third, fourth, and fifth). 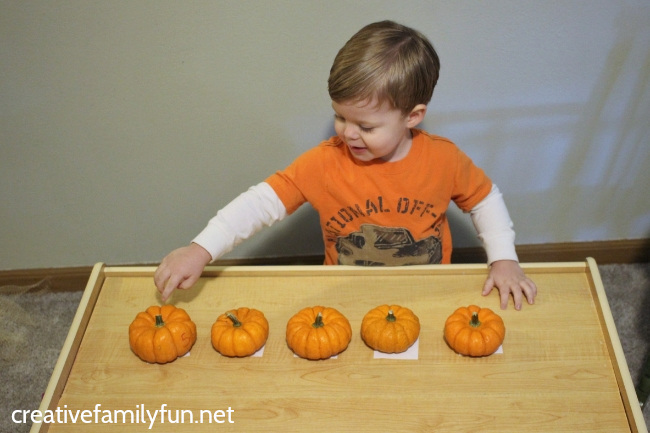 Read Five Little Pumpkins to go along with this counting activity. Choose your favorite version. The story uses the words first, second, third, fourth, and fifth to talk about what each of the little pumpkins does. 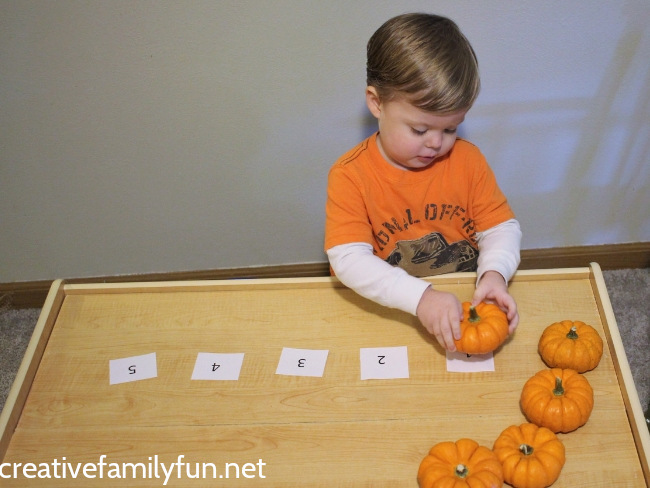 Days with Grey shares a Scoop and Count Pumpkin Activity that’s perfect for practicing counting, number recognition, and subitizing. They put the pumpkins in water but you could use anything (or just an empty bin) for this one. 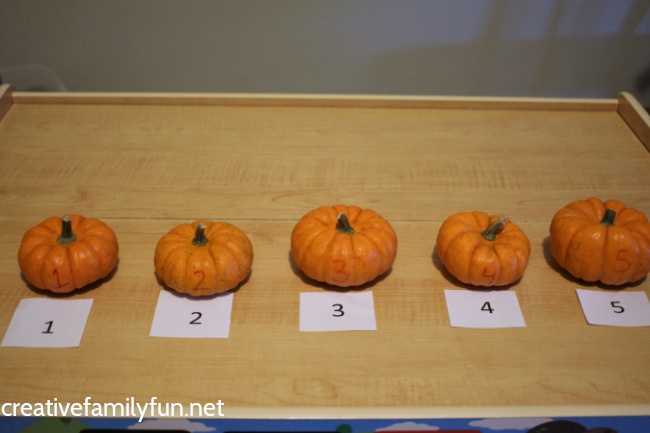 Make your own Pumpkin Patch Numbers Game with this idea from Rainy Day Mum. My Storytime Corner has a Dabber Pumpkin Count Activity that asks preschoolers how many pumpkins are on the gate. 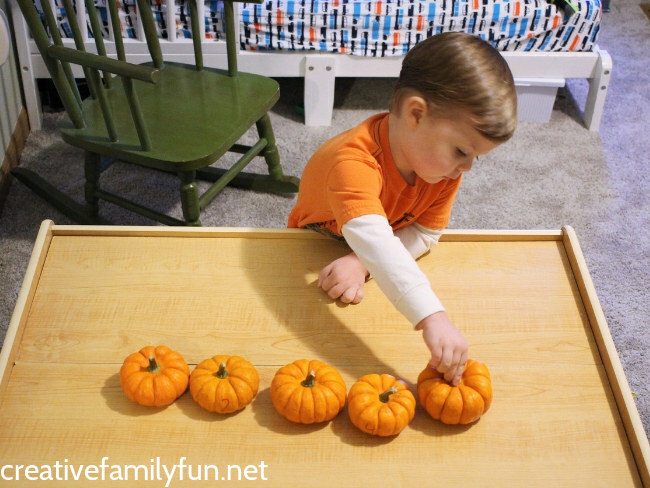 Use this Five Little Pumpkins Playdough Activity from Clare’s Little Tots to retell the story. Fantastic Fun and Learning created a jack-o-lantern number line to practice number skills. 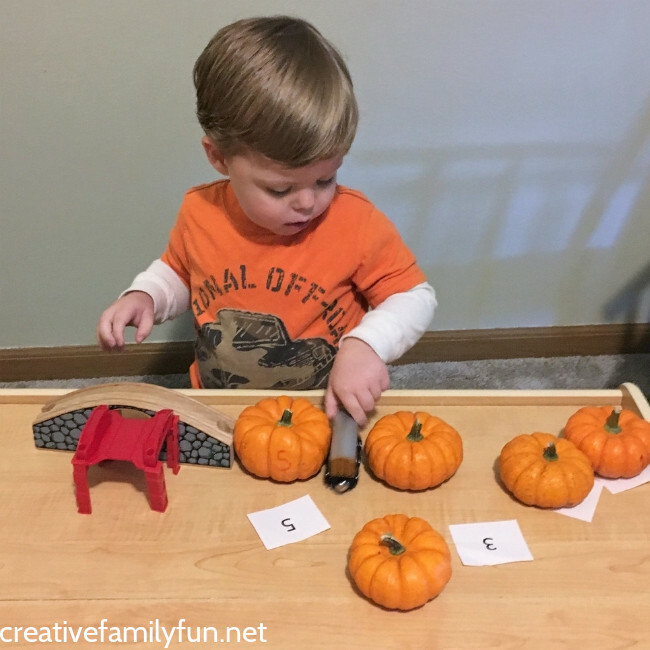 Practice counting and fine motor skills using clothespins with this counting pumpkin activity from Lalymom. 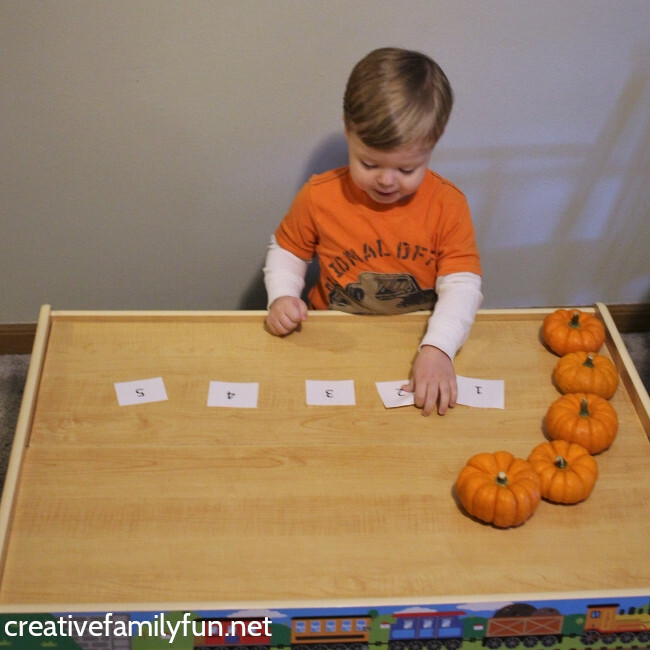 Take your pumpkin counting to the light table with this idea from Where Imagination Grows. Pre-K Pages has several Halloween themed activities for practicing one to one correspondence. 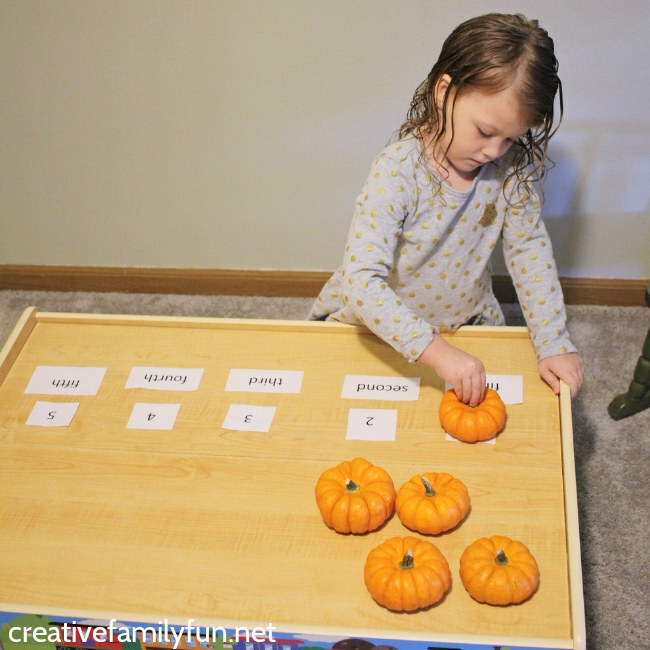 Check out the pom pom pumpkin and pumpkin seeds counting activities. Work on pre-writing skills with pumpkins and a chalk marker. 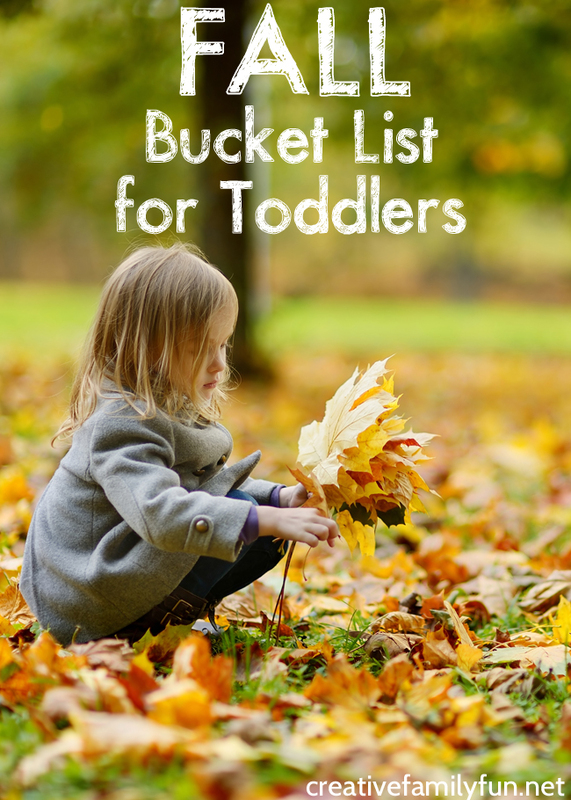 Check out our Fall Bucket List for Toddlers. After carving your pumpkin, make some pumpkin oobleck with real pumpkin. When my kids were little (toddlers and preschoolers) we did a lot of craft projects. We always kept them simple because they certainly weren’t capable of pretty Pinterest crafts when they were that little. 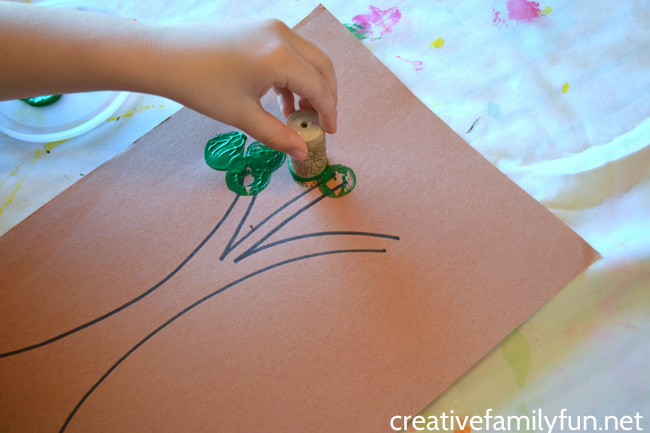 This fun cork print tree craft was a favorite from our list of simple crafts for toddlers. It’s simple, creative, and fun. My girls loved this project! 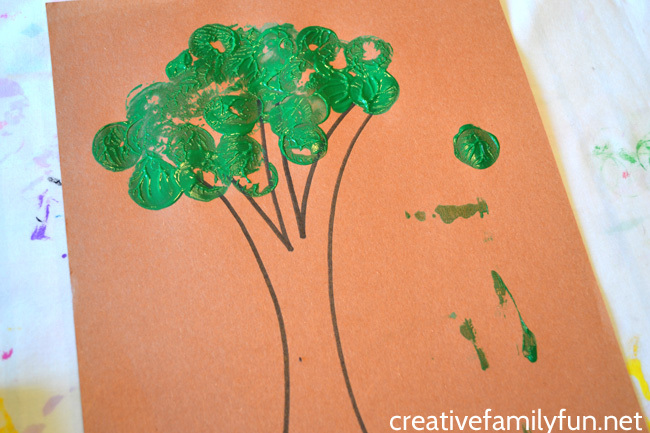 Note: Use yellow, orange, and red paint instead of the green paint if you’d like to create a colorful autumn tree. This project does require a little bit of adult-helper prep. First, you’ll want to draw a simple tree shape on the brown construction paper with your black marker. You just want to draw a simple trunk and a few branches. As you can see below, you don’t need many drawing skills to draw your tree. Next, find a flat container for your paint. I usually save a few lids from plastic containers, such as a cream cheese or sour cream container. Clean them up and you can reuse them over and over again for painting projects. 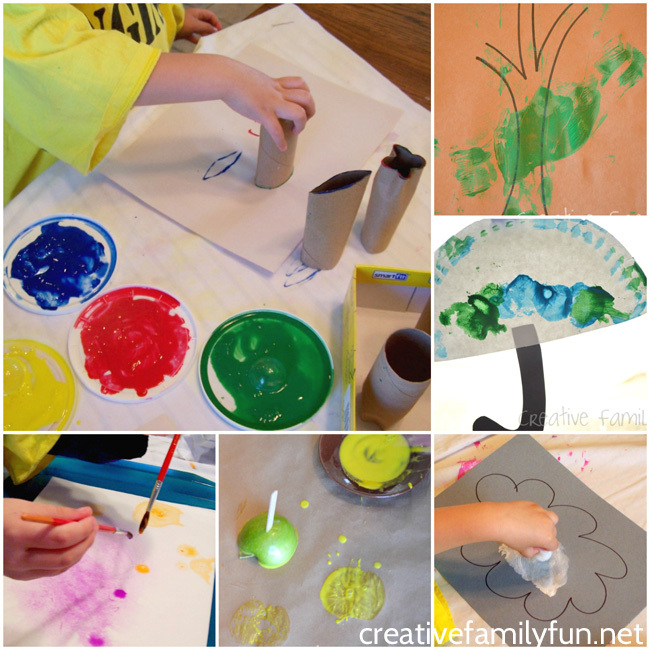 Click here for all of our fun and simple crafts for toddlers. Pour a little bit of green paint onto your plastic lid. Provide a blank tree and a wine cork. 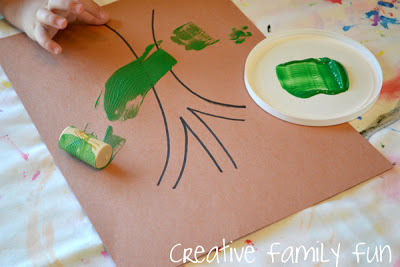 You’ll want to show your child how to dip their cork in the paint and then stamp the leaves on the tree. Don’t worry about perfection. One of my kids dipped and stamped and the other just rolled her cork around. Both trees turned out great! Let your kids use their cork stamps as much as they want. Their tree may be full of leaves or have just a few leaves. Maybe all the leaves are on the ground! 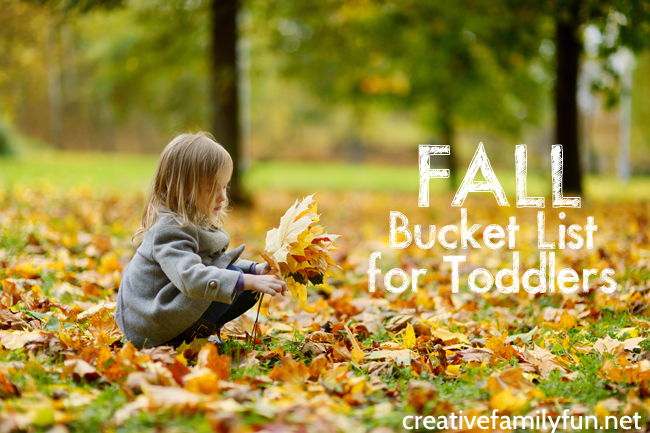 You can turn this into a fun fall craft if you switch the colors of paint and use red, yellow, or orange instead. 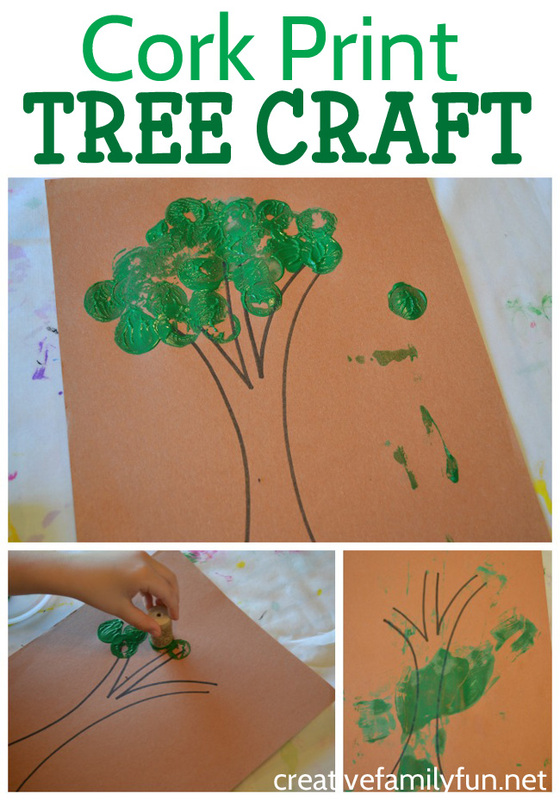 This fun cork print tree craft is a fun and easy craft for toddlers and preschoolers. It lets them explore paint and printmaking in an age-appropriate way. 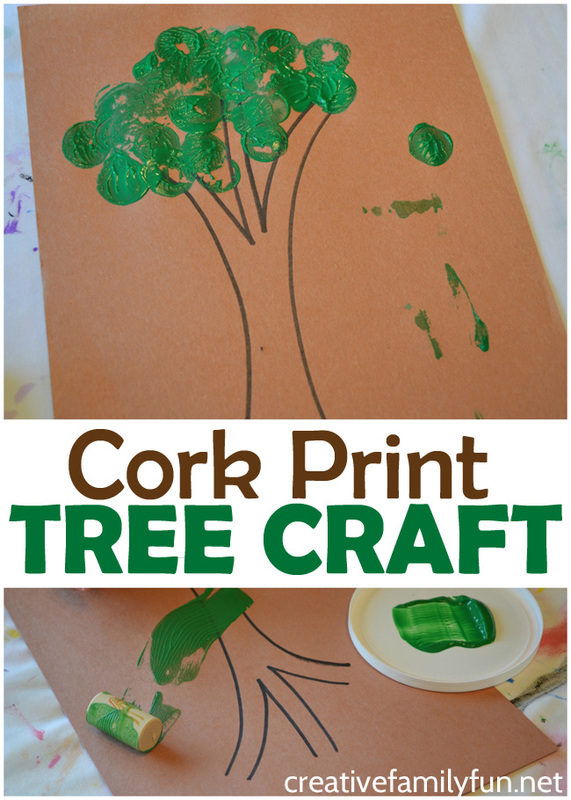 If you enjoyed this cork print tree craft, the photos are perfect for sharing on Facebook or Pinterest. We’ve always loved arts and crafts at our house, even when my girls were toddlers. 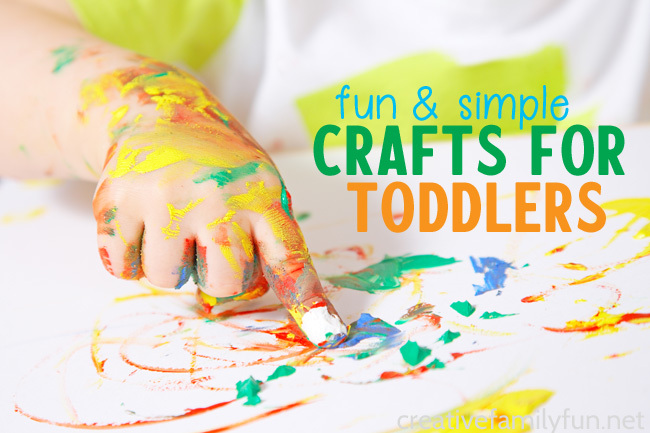 But, sometimes it’s hard to find crafts for toddlers that are simple and age appropriate. So many cute crafts are much better suited to older kids. Luckily, I’ve got some great ideas for you. 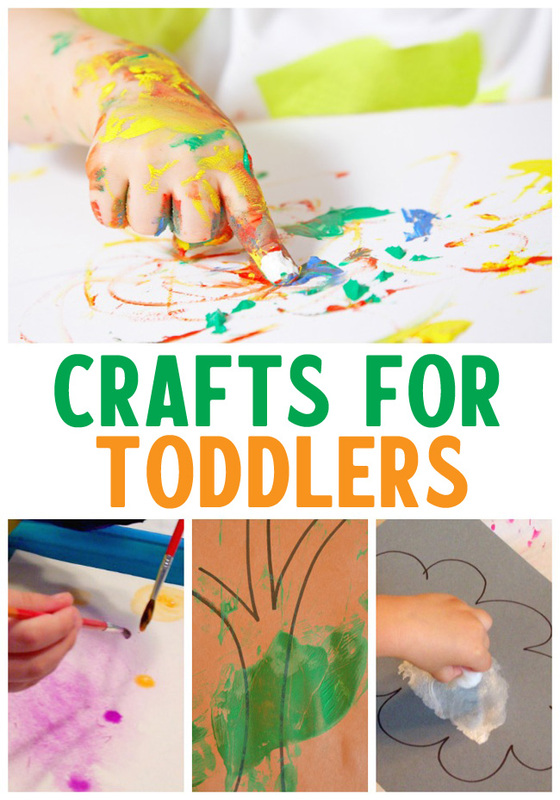 The crafts you’ll find below are all well suited to toddlers. They get to be creative, have fun, and learn, learn, learn. 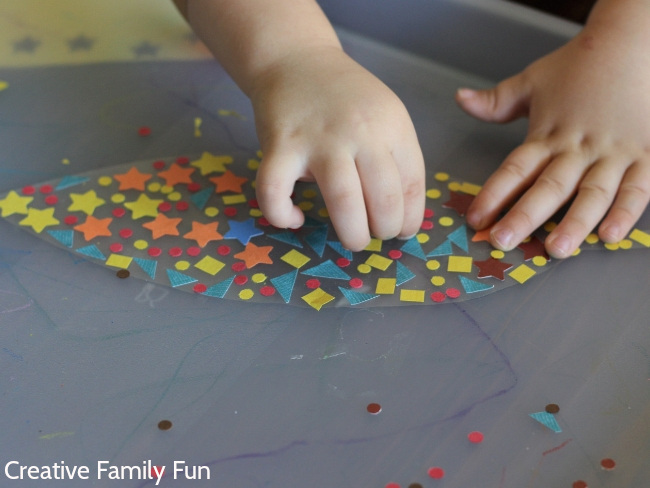 And, once you’re done making crafts, try one of these fun activities for toddlers to spend more quality time together. 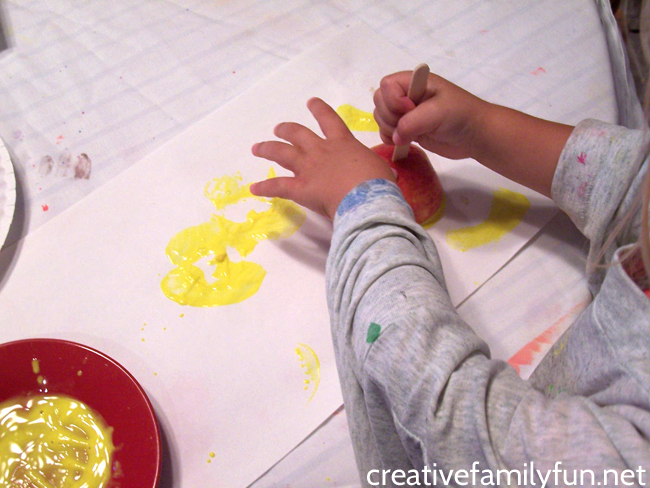 Cardboard Roll Stamping – a simple printmaking project that is perfectly suited to toddler hands. Easy Mask Making Activity – let your toddler get creative with a simple art invitation. It takes just a few minutes to make the mask templates and then your toddler can decorate it on their own. One important thing to keep in mind when making crafts for toddlers is that the process is more important than the product. Your crafts will not be Pinterest worthy and that’s ok. 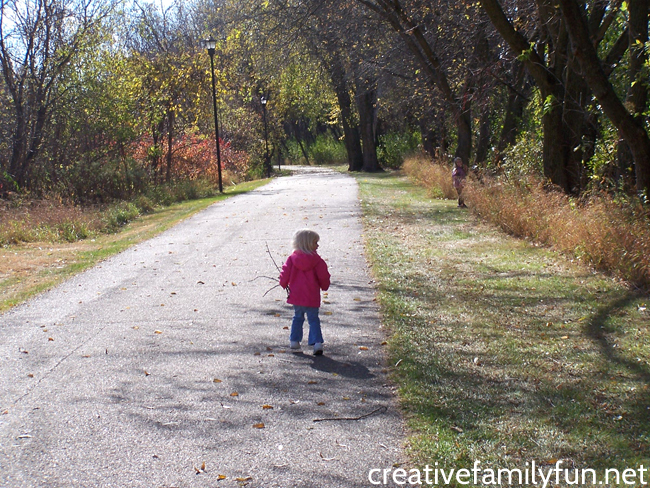 Your toddler will have fun, learn a lot, and be able to take ownership of their craft. That’s what’s important. Let them get messy and experiment. The experience is what matters. And, you know what, the result is going to be absolutely beautiful because they did it all themselves!